Members of the band/group should understand who owns what. That means talking it out and having it in writing. Figure out copyrights when there’s no dispute and theres no money. No one fights over an empty pot. But don’t forget to copyright other properties like cover art, music videos, etc. First and foremost, go to Copyright.gov – it’s really easy to navigate and has tons of up-to-date resource regarding copyrights. The office also responds very quickly to questions submitted through the site. There’s also a toll-free line you can call. ASCAP: the American Society of Composers, Authors and Publishers protects the rights of its members by licensing and distributing royalties for copyrighted work. It’s only $35 to join as a songwriter. BMI: also collects license fees on behalf of songwriters, composers and music publishers and distributes them as royalties. It’s free to join as a writer, and I believe it’s $200 to set up a publishing company. Sound Exchange: collects royalties from satellite radio (such as SIRIUS XM), internet radio, cable TV music channels and similar platforms for streaming sound recordings. Harry Fox Agency: not a PRO, but a mechanical licensing, collection and distribution agency for music publishers. As a first step, do a search to see if anyone else is using the name you want to trademark, anywhere in the world. Search Google and other search engines, but also try resources like All Music Guide and the US Patent & Trademark Office.Then, consult a trademark lawyer and have them do a search as well. There are various categories of trademarked goods/services including entertainment, merchandise and sound recordings. The cost for filing a trademark application alone is $325 per category. The panel also discussed several other topics, from streaming music online to work for hire situations. There are lots of technicalities with these important business issues, so I won’t try to break that down here. 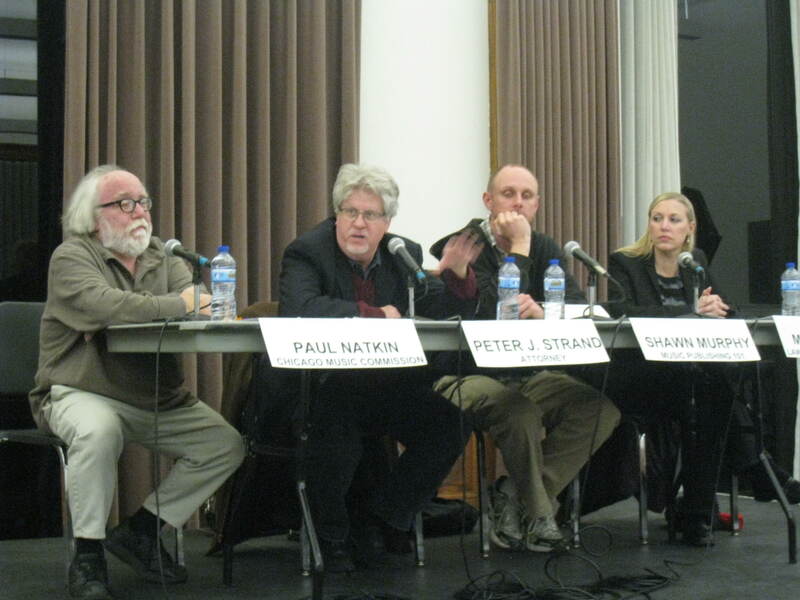 For those details, you should definitely check out the full audio recording of the panel on the Chicago Music Commission website later this week. You should also check out the Lawyers for the Creative Arts who provide free legal services to eligible artists.